Umi No Houseki is one of the HABA Special Care products, meant to add special focus to your daily regimen. Your basic HABA regimen should start with the cleansers, toners, and moisturizers in either HABA Moist or HABA Fresh. 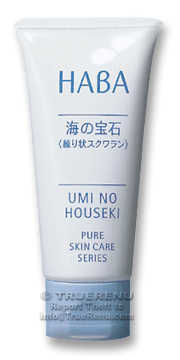 HABA Umi No Houseki is a Squalane moisturizing balm. It slowly penetrates into skin to moisturize even the roughest, driest skin. If you'd like to learn more about HABA, try one of the products - and toss our 10-Product Trial/Sample Set (item 4904) in your shopping cart for a luxurious way to sample many of their most popular products. Squeeze desired amount on palms, rub into affected areas. Effective for face and body. Ingredients: Squalane, dextrin palmitate, tocopherol. Product Size: Net Weight: 30g, or about 1 US oz. Only 5 Available - Order Today!